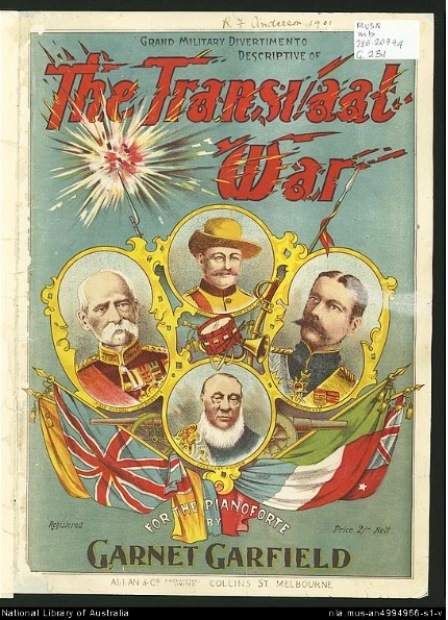 When war broke out between Britain and two Dutch South African republics in 1899, colonial defence units as well as civilians throughout Australia volunteered their services to the Empire. 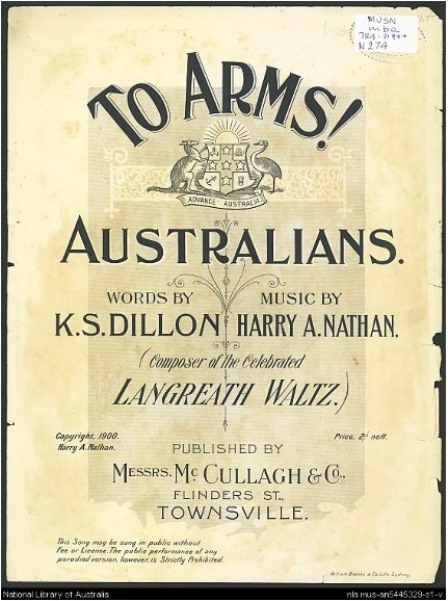 The Australian Regiment was formed by the amalgamation of companies from New South Wales, Victoria, South Australia, Western Australia and Tasmania. 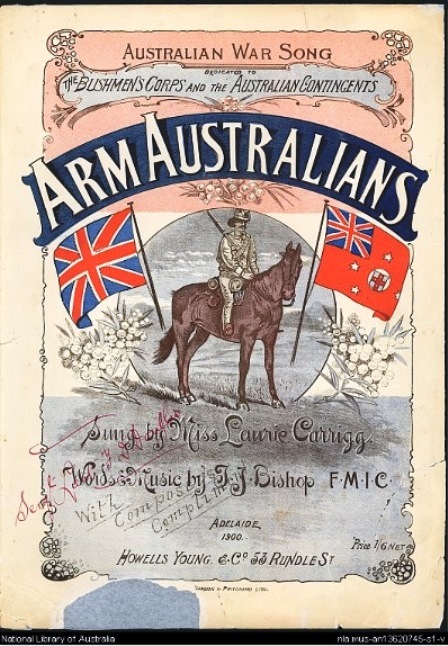 Piano pieces were written to commemorate the service of Australians during the Boer War. These piece fall into the four basic categories, namely marches, drawing room music, songs and battle pieces. 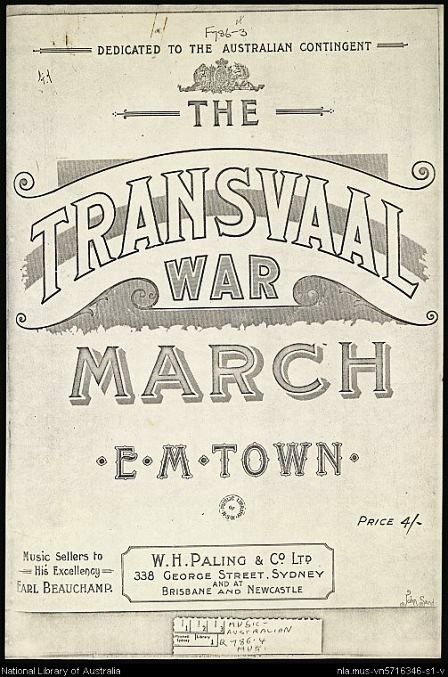 The march titles include The Transvaal War March by EM Town, dedicated to the Australian Contingent and The Grand Patriotic March by JW Juncker, published by John Hunter. 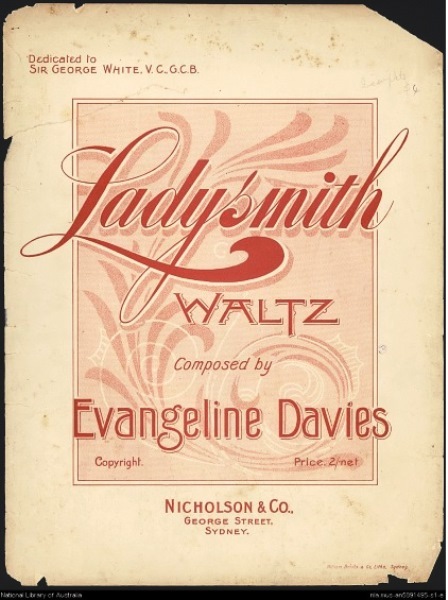 Ladysmith Waltz by Evangeline Davies and Khaki Waltz by E Augusta Rudder, dedicated to the First Australian Bushmen's Contingent. 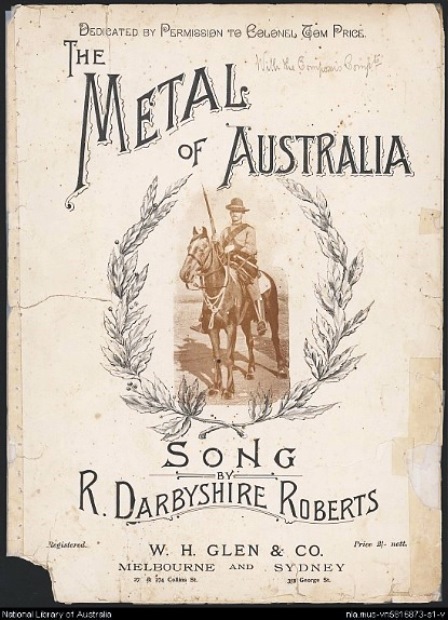 The Metal of Australia; song by R Darbyshire Roberts, published by W.H. 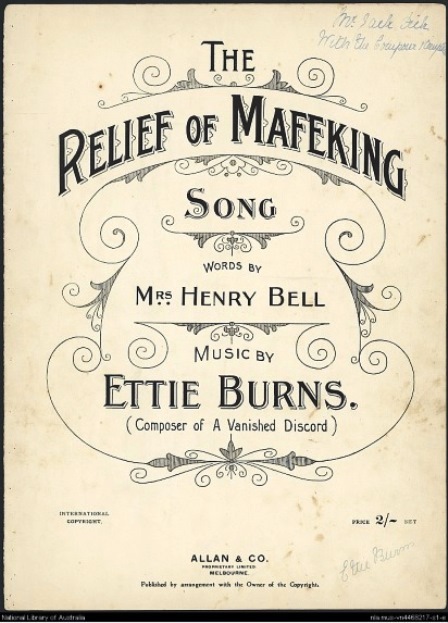 Glen in Melbourne around 1900 and The Relief of Mafeking by Ettie Burns, with words by Mrs Henry Bell. There are several other songs. These can all by found by looking up the National Library Catalogue. 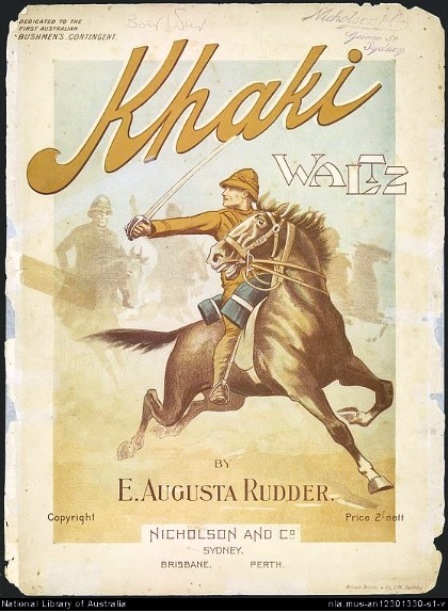 Several of the songs are digitised. 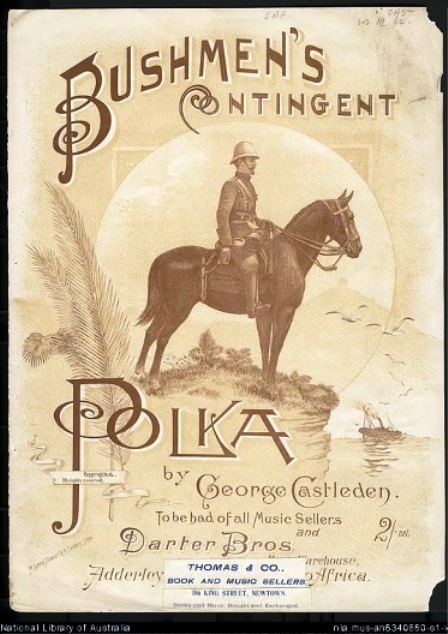 Pianistic battle pieces written about contemporary battles that Britain was engaged in that were in the news were very popular as part of drawing room entertainment during the Victorian era in Britain and British colonies. They were highly marketable and attractive to the consumer who felt great national pride at Britain's military might and conquest. The battle piece was descriptive in character, always following a particular format. There were bugle calls, approach marches, cavalry charges, battle engagement, cannon fire, cries of the wounded enemy upon defeat, British patriotic songs and shouts of victory. It always ended with the British National Anthem or a British patriotic piece. The battle piece encouraged audience participation. It often came with accompaniments for other instruments like the violin and cello. Military instruments could also be employed such as kettle drums, the horn and the trumpet where these appeared in the music. People listening could join in singing along with the songs in the music. They could also create the sound effects of galloping horses, flying bullets, swords clashing and cries of the wounded. 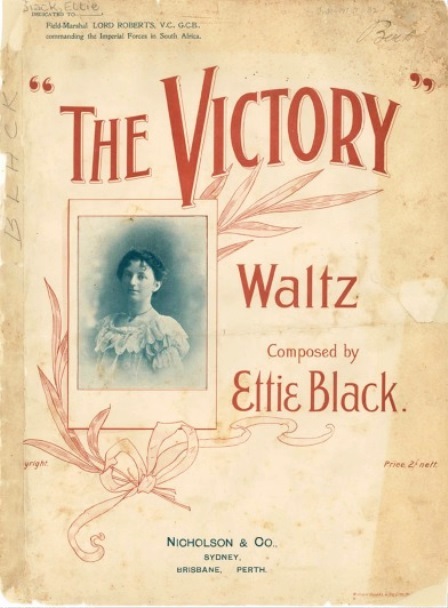 Through the battle piece composed for piano, families could relive the event of Britain's victory over and over again in the drawing rooms of their homes. 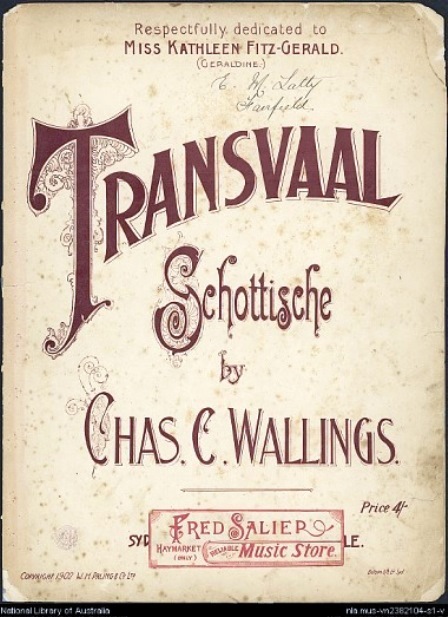 Included among the battle pieces commemorating the South African War are Grand Military Fantasia Descriptive of the Relief of Ladysmith for Pianoforte by Landon Roberts and Grand Military Divertimento Descriptive of The Transvaal War for the Pianoforte by Garnet Garfield. 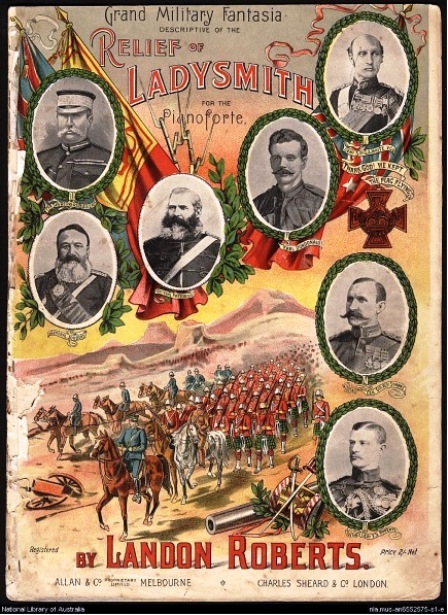 The sections in Landon Roberts' battle piece are as follows: British Retire from Dundee, At Ladysmith (sunrise), General Sir George White orders a sortie against besieging Boers, Cavalry Trumpet, Cavalry Advance, Naval Brigade, Song 'Sons of the Sea', British Surprised by Boers, The Attack, Creusot Guns, British 12 pounders, Stampede of Mules, British Disaster, Rejoicing of Boers (Boers' National Melody), Boer Artillery Shell Ladysmith, Long Tom, Anxiety of Besieged, Prayer, Band of General Buller's Relief Forces in Distance, Entry into Ladysmith, Grand March, British patriotic song Rule Britannia, British National Anthem God Save the Queen. 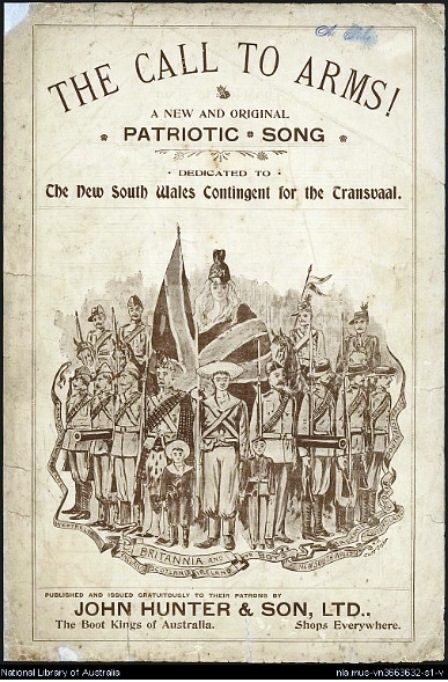 Other British patriotic songs included are When Johnny Comes Marching Home Again and Red White and Blue. As can be seen in the times when there was no electric media such as radio, television, DVDs and computers, the battle piece and other military pieces were used as a source of news and entertainment. They had an agenda of stirring up patriotism, public favour towards the war effort and summoning recruits. They showed pride and praise towards those men who had served in the war so gallantly, suffered courageously and offered up their lives. 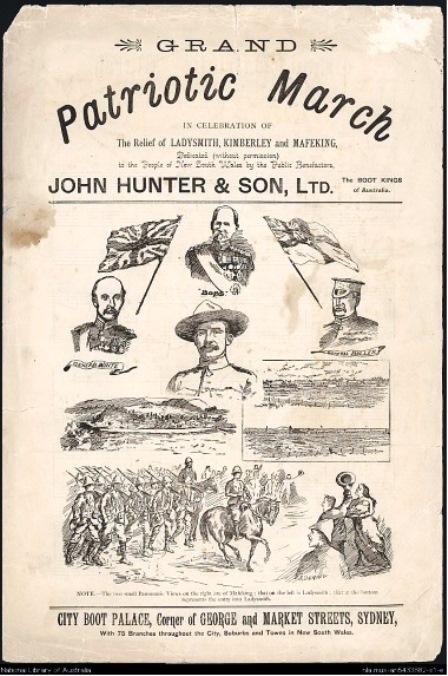 Military pianno pieces recording the South African War carry with them memory of the daring and spirited way the Australian colonial soldiers fought, while suffering at the same time unjust treatment and an attitude of superiority on the part of the British. In fact, it was the Australians who demonstrated superiority. Being of pioneer stock, they showed greater resourcefulness, ingenuity, intelligence, physical strength, individuality and fearless courage. They found their way around the country with greater efficiency and mobility and they bound all these attributes and skill in a greater sense of humour. 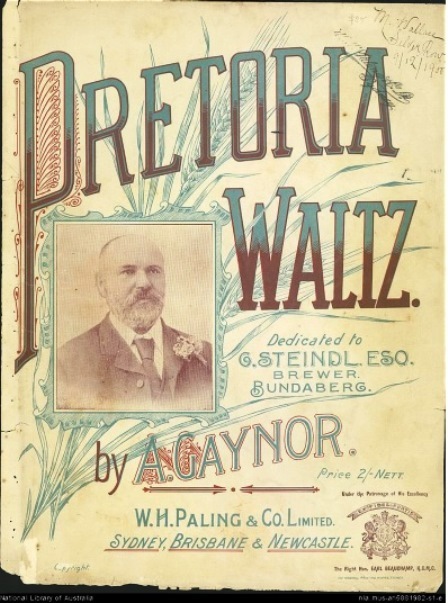 Military piano pieces about the South African War provide evidence of a developing Australian identity. 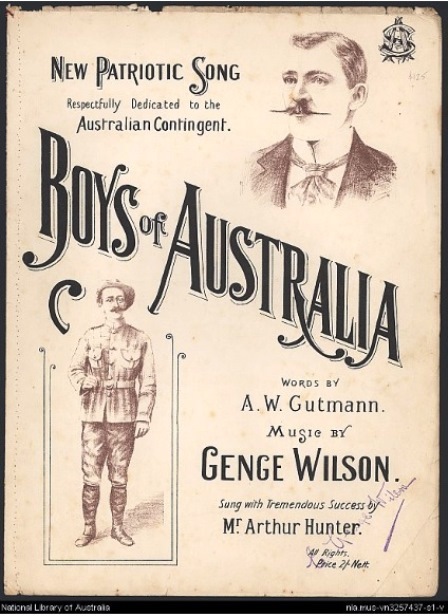 When played in the drawing rooms of Australian families and particularly in the case of the South African battle pieces being enacted again and again, these pieces reinforced sentiments of Australian patriotism, identity, pride and courage every time they were performed.